This kit has everything you need to replace your existing vent or install a new one. Standard kit (314340) comes complete with 36 screws and 8' of putty tape. 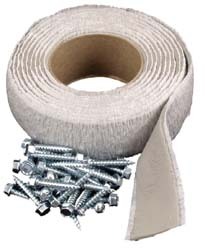 Deluxe kit (314341) includes 36 screws and 8' of butyl tape. 1 per pack. We offer the best so you worry less with higher quality and better performance that outlast all other brands. We carry all the accessories and hardware needed to make installation easier and more productive.